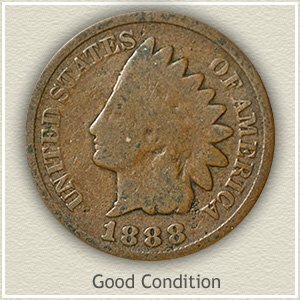 Your 1880 Indian head penny value is often higher if close attention is given to its condition. Wear to a coin’s surface is carefully examined by collectors and dealers, known as "grading." The amount of detail remaining on a coin is judged in an effort to find ones with the least wear. Specifically check you coin for details within the feathers, finding any separation and vertical lines indicates a higher quality, higher value piece. Today’s demand from collectors exceeds the small supply of these better quality, well preserved 1880 pennies. Vast numbers have been lost to time and heavy use. As listed on the chart its minimum value indicates all are uncommon. 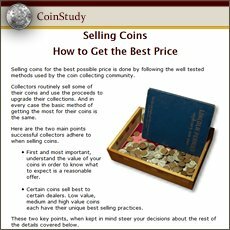 Your coin, even in lightly worn condition is appreciated by collectors. Nice, original coins add quality to any collection. 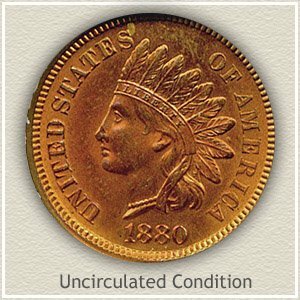 In "uncirculated" condition, the image to the right is an example, 1880 Indian head penny value is well above $62. Bidding results of a gem quality coin at auction are detailed below. Golden highlights illuminating the design and legend draws your attention to this gem 1880 Indian penny. One of a rare few surviving with original mint luster. US copper coins naturally turn dark quickly, also they tend to pick up marks and abrasion. Those fortunate examples remaining bright and mark free attract high bidding at auction. 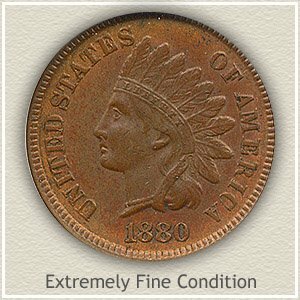 Value of this 1880 Indian penny reached $327 at a David Lawrence rare coin auction. It illustrates the popularity of Indian pennies and the strength of the market. Any 1880 penny is scarce enough to have a value higher than the latter 1890s dates. Additionally the auction represents the price a serious collector is willing to pay to add top quality to their collection. Date of your coin, its condition plus market demand all combine to set 1880 Indian head penny value. Judging the condition of your 1880 penny leads to its accurate value, perhaps higher value. The various stages of wear to a coin are defined by a "grade" represented with the following images and descriptions. Compare your coin to these images and distinctions from one grade and value begin to appear. Uncirculated: Shortly after minting this 1880 penny still in uncirculated condition was put away and never used. The highest parts of the design have not been disturbed by wear. Check the Indian‘s cheek, hair and ribbon below her ear and the tips of the feathers. If there is any wear, these areas show a smoothing to the surface and the original luster is disturbed. Fine: Noticeable are parts of the hair and headband have worn to the point of merging. Feather details are missing at the ends. Her cheek no longer is rounded. Despite this moderate wear your 1880 penny still has a pleasing look. Good: Worn to a shallow relief with little detail remaining describes a coin in "good" condition. The area surrounding the eye is slightly defined. Just visible is a separation of chin and neck. The headdress and feathers are worn smooth showing just an outline. Although the lettering and date are heavily worn they should be separated from the rim. 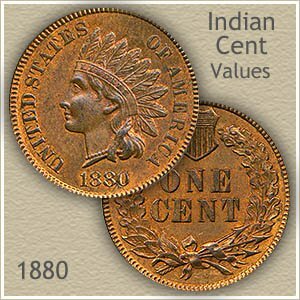 Your 1880 Indian head penny value may be at the low end of the scale but because of its history they remain an important coin. A very popular coin, everyone understands and has heard of the value of an Indian Head penny. Common dates are now worth one dollar each. Many collectors are building collections and putting a heavy demand on the rare dates and better condition coins. 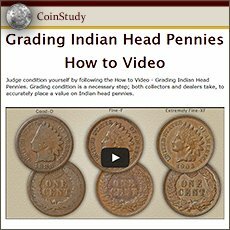 Compare all your Indian head penny dates to the values chart. Match your coins to the grading images, determine their grade and find an accurate value on the charts. Some of these old pennies have amazing values. All old US coin values. It is an excellent index with images and text links to all coin series, from Cents to Gold. 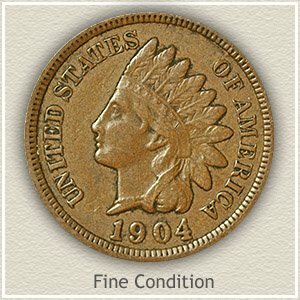 Value charts, grading images and descriptions uncover not only the value of Indian pennies but how much your box of old coins is worth.